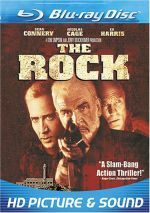 1996’s The Rock remains one of the better films produced under Jerry Bruckheimer’s authority, and that flick solidified the success of another popular whipping boy, director Michael Bay. He’d hit modest gold with Bad Boys and The Rock made him a big name in Hollywood, powerful enough to be granted the reigns of mega-expensive Armageddon for 1998. Without question, Bay’s films are victories of style over substance, but that’s not always a bad thing, especially when the style is as fun as The Rock. Actually, The Rock offers one of the more complex and layered flicks from the Bruckheimer factory. In it, a pack of renegade Marines headed by much-decorated General Hummel (Ed Harris) takes 81 captives hostage during a tour of the former prison complex at Alcatraz. Hummel wants the US government to pay reparations for covert servicemen whose families have been left high and dry over the years. However, the hostages aren’t there solely to entice the bigwigs to pony up the dough. No, they’re taken to ensure the military doesn’t simply bomb the renegades out of existence. The real threat offered by the Hummel corps comes from four rockets laden with poison gas. If they don’t get their money, these will be launched, and they’ll cause thousands of deaths in and around San Francisco. In an attempt to rescue the hostages and negate the rockets, Navy SEALS are sent to take care of the situation. Two extra helpers pad their numbers as well. We get FBI chemical “superfreak” Stan Goodspeed (Nicolas Cage), an expert in gas warfare but a desk jockey unaccustomed to field work, plus creaky old spy John Mason (Sean Connery). The latter is literally the man who knows too much, and the powers that be have kept him unfairly imprisoned for the last few decades. As with virtually every Bruckheimer production, The Rock benefits from an excellent cast. Actually, this is one of the best Bruckheimer amassed, though the use of Cage seemed somewhat controversial at the time. He was then known as a quirky actor and had just come off of his Oscar-winning appearance in Leaving Las Vegas. Cage seemed too odd to be an action hero, but he proved winning in The Rock. It was nice to see someone a little different for once; he wasn’t the omnipotent killing machine we usually find in such roles. Although Cage has come under lots of criticism in subsequent years for his move toward this kind of film, I think he gives the film a nice twist. Okay, that scene doesn’t sound like much, but in the possession of Cage, it works wonderfully. Few actors could pull off the mix of confusion, surprise, and earnest backtracking he demonstrates. I’ve tried to use the line in arguments with girlfriends - unfortunately, it didn’t work so well for me. The magisterial presence of Connery adds a lot to The Rock as well. Even if Connery couldn’t act, he’s such a solid force that he helps make movies more fun, and since he essentially gets to play an older, creakier version of James Bond, his performance becomes even more enjoyable. Connery may have been in his mid-sixties when he made the film, but he still supplied a believable action hero. The movie doesn’t force him into any kind of unrealistic physical situations, so he’s allowed to present a dynamic persona without absurd activities along the way. Connery grounds the flick and allows Cage’s character to grow and mature in a natural manner. As the final member of our starring trio, Harris gets the least screen time, but he’s excellent as usual. Few actors can play stern military intensity like Harris, and you always believe that the character is as experienced and tough as we’re told. One unusual aspect of Hummel is that he’s as reluctant a villain as you’ll find. Frankly, I don’t like to call him a “bad guy”, for he’s not. Hummel is the impetus for the threatening events that take place, but he’s never shown as an evil or malicious person. If anything, we can easily empathize with his side; had the story been told from a different perspective, Hummel readily could have functioned as the hero. Harris brings out the various qualities in the character and makes him much more three-dimensional than 99 percent of all action film antagonists. As for Bay’s style, I can understand the criticisms that have been leveled on him. He really loves those quick edits and spinning cameras, doesn’t he? Bay also adores excessive sentimentality and he can really lay it on thick at times. Granted, The Rock doesn’t indulge in emotionality to the degree of Armageddon, but I can’t deny that Bay is one of the more manipulative filmmakers on the scene today. Nonetheless, he makes modest material become much more stimulating and exciting than it should. Many people seem to think that any chimp could direct a “brainless” action film, but I disagree. Actually, that form of movie needs a competent leader more than most other genres because of the variety of elements the director must corral. This is an over-simplification of duties, but as I see it, character dramas and mysteries rely more on strong writing, while comedies require the most talented performers. Action movies of all sorts, however, need powerful directors because they’re such huge undertakings. Without someone in charge who knows what he wants, these flicks become messy and unfocused. Visual style also is a much more important component than with most genres, so while some may slam Bay for his slick images, I think they serve the material well. No matter how good the script and the actors may be, an action film won’t work unless the director ultimately ties it all together and lets it fly. Bay does so, and he does so with flair and panache. Without question, The Rock has its problems. Pacing seems awkward at times, especially when all the Alcatraz material is ignored for quite some time so we can watch a fairly gratuitous car chase. Most personal relationships - especially those between Stan and Carla, as well as between Mason and his daughter - are played for nothing more than cheap emotion; they exist for no reason other than that. The dialogue is often awkward and silly, and a number of elements simply don’t coalesce as well as we’d like. Nonetheless, I think The Rock is a successful film. It entertained and thrilled me for much of its 136 minutes, and I enjoyed the ride for the most part. It doesn’t stand alongside the greatest action flicks such as Die Hard, but it certainly is a solid effort. The Rock appears in an aspect ratio of approximately 2.35:1 on this Blu-Ray Disc. This became a good but not great presentation. For the most part, sharpness seemed positive, as the majority of the flick demonstrated appropriate accuracy and definition. However, more than a few slightly soft shots popped up along the way, a factor not helped by some mild but consistent edge haloes. No issues with jaggies or shimmering occurred, and print flaws remained absent. I didn’t think digital noise reduction was a substantial concern, but the movie could seem a bit “processed” and not as film-like as I’d prefer. Colors looked fine. Golden tones seemed strongest, but other hues showed fairly positive reproduction. Blacks were reasonably tight, and shadows were decent; those could be a little thick but usually appeared adequate. The image was pretty good overall but not as strong as it should be. I felt more consistently pleased with the active and involving Uncompressed PCM 5.1 soundtrack. All five channels get a terrific workout throughout the film, with little time off for a rest in between the movie’s many action scenes. Music spread cleanly and distinctly across the front speakers and also received some reinforcement from the surrounds. Effects were the stars of the show, and they blasted from all directions during much of the flick. Audio seemed well-localized and accurately-placed, and the sounds also blended together smoothly to create a neatly-integrated environment. As far as highlights go, no particular scenes stood out in my mind, but the second half of the film functions almost as one continuous demo reel. Audio quality also seemed very good. Dialogue appeared a bit artificial at times - obviously much of The Rock needed to be looped - but the lines were consistently intelligible and distinct, and no edginess appeared with the speech. Music could have been slightly brighter, but the score largely sounded clear and dynamic, with good bass response. As was the case with the soundfield, the effects were the strongest aspect of the mix in regard to quality. The wide variety of sounds - from explosions to gunfire to jets to a myriad of ambient noises - were accurately reproduced without any signs of distortion. When appropriate, bass response seemed tight and deep, and the louder scenes offered a real impact. The track provided a taut and engaging auditory experience. How did the Blu-ray compare to those of the Criterion DVD from 2001? Audio was a bit smoother and more dynamic, while visuals looked cleaner, more accurate and vivid. Though I found some concerns with the image, it still marked a notable improvement over the DVD. Most of the DVD’s extras reappear here, starting with an audio commentary. 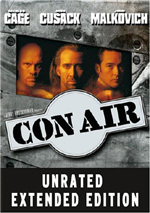 This piece includes actors Nicolas Cage and Ed Harris, director Michael Bay, producer Jerry Bruckheimer, and technical advisor Harry Humphries. As is typical of Criterion commentaries, all of the participants were recorded separately and the results were edited together. This creates a lively and engrossing discussion of the film and many other subjects. 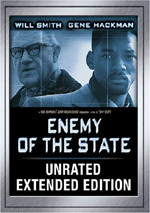 We learn a tremendous amount of information about the production such as the approaches taken by Cage and Harris to their characters, Bruckheimer contributes some of his ideas on filmmaking, Humphries discusses the real-life aspects of the situation, and Bay chimes in with a variety of issues and anecdotes. Although all five men provide interesting comments, Bay and Cage are really the stars of the show. Cage still appeared defensive about his move to action films, and he spends much of his time telling us of his inspirations and they ways he tried to make the character unique. As is always the case with the director, Bay is an engaging and energetic presence who seems honest and blunt with his opinions, and he offers lots of solid information about the creation of the film. Criterion audio commentaries are almost always very good, but this one stands among their best; I’ve listened to it four times since I got the laserdisc in 1998 and I still find it entertaining and compelling. After this we find Navy SEALs On the Range, a five-minute and 55-second piece that follows one of Harry Humphries’ classes on gun handling. We learn some nice tidbits about weapons training plus we also hear about requirements needed to get into the SEALS and the kind of rigors through which they must go. Next up is Hollywood Humphries and Teague a program that features Humphries along with actor Marshall Teague. In this eight-minute, 18-second piece, they demonstrate the many mistakes found in movies that use guns and tell us how the weapons would work if used in the ways we see depicted. It’s a witty and informative piece that shows how unrealistically most flicks depict gunfire. An episode of Movie Magic dedicated to The Rock provides seven minutes and 50 seconds of material about the special effects used in the film. Of primary focus are the cable car explosion and the computer generated jets at the end of the movie. It’s a superficial but generally interesting look at this component of the process. Special Effects for Dive Sequence lasts seven minutes, 46 seconds and takes a moderately detailed look at the creation of that portion of the movie. Visual effects supervisor Hoyt Yeatman provides commentary as we watch images of the different effects elements. Again, it’s not a terribly in-depth piece, but it seemed useful and entertaining. In addition, we find footage of the film’s world premiere, which took place on Alcatraz. That piece lasts for one minute, 55 seconds and is mildly interesting but doesn’t offer much. Quite stimulating, on the other hand, are the eight minutes and 51 seconds of Outtakes we find. Don’t look for the usual “actor flubs a line and laughs” junk here - these are absolutely terrific looks behind the scenes of the production. Easily the best part of the set are the shots of Ed Harris’ multiple meltdowns. You know, I don’t think the intensity he displays as a performer is just an act! Anyway, after the commentary, the “Outtakes” are the best part of the supplements. Secrets of Alcatraz provides 14 minutes and 39 seconds of background information about the island. The details are presented in a fairly dry, PBS-documentary style, but we do learn a lot of good information about “the rock”. It’s not required viewing to enjoy the movie - and it actually contradicts some “facts” presented in the film - but it’s a nice piece of history. Finally, a Jerry Bruckheimer Interview occupies 16 minutes, seven seconds. Bruckheimer covers his early interests in film and discusses how he became involved in the business. He also talks about specific aspects of the production of some of his movies, with a logical emphasis on The Rock. The disc opens with ads for WALL-E, Gone Baby Gone. We also find the teaser and theatrical trailer for The Rock along with five TV spots. The Rock remains one of the better offerings from the Bruckheimer factory, as it combines a typically fine cast with a more serious-than-usual subject and provides an exciting experience. The Blu-ray gives us generally good picture, excellent audio and a roster of bonus materials highlighted by a fascinating commentary. While I’d like a stronger visual transfer, this nonetheless becomes the best version of the film on the market.